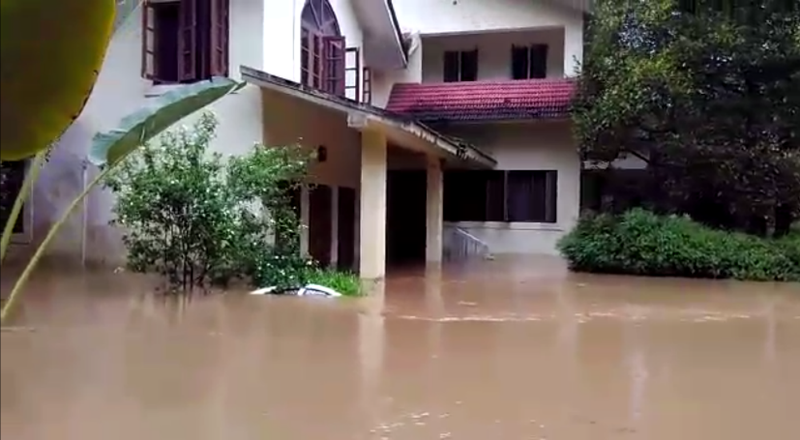 In August, much of the state of Kerala, India, was submerged following devastating floods with the highest recorded rainfall in almost 100 years. Indian Union Secretary Fr Syam Kumar MSC writes to tell us about the terrible destruction caused at the Sacred Heart Seminary in Kanjoor, Ernakulam. “The floods in Kerala caused the deaths of hundreds and drove many millions out of their homes. With the highest rainfall in nearly a century, Kerala state hit the headlines of every newspaper in the country. God’s own country was drowned; we MSC in Kerala were also affected very severely by the unprecedented rainfall and the unexpected rising of the water levels in the River Periyar which flooded our campus in Kanjoor village. Like many millions who were afflicted by the Kerala floods, our men were also forced to flee for their lives, fearing the deluge. Located by the bank of the River Periyar (which means ‘big river’, and indeed it is a big river), is our seminary. The seminary was built to train our men in their Novitiate year, and is most suitable for prayer, reading and reflection. The beauty of the view of the river from our campus is so serene that many who visit this campus would love to visit us again and again. Many say that they love to while away the time, simply sitting there. 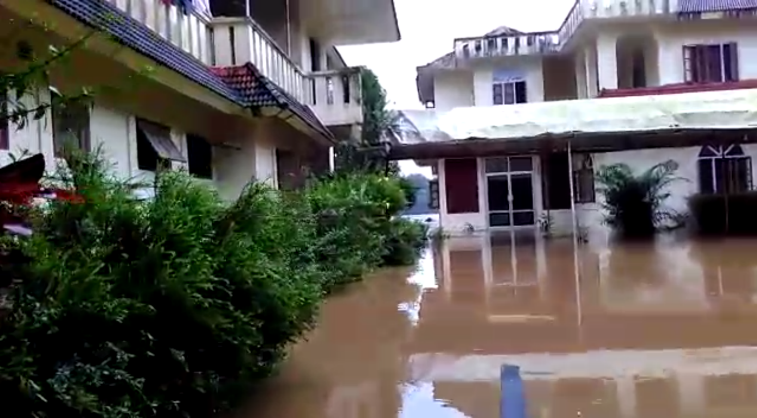 Since the unusual rainfall during this monsoon, the water level in the river started rising to alarming heights. On August 15th, our confreres went to the parish church for the blessing of the newly refurbished church. Once they returned from the celebrations, the priests and brothers realised that continuing to stay at the seminary would be life-threatening, and they started shifting every mobile piece of furniture, home appliances, utilities, and whatever else they could, from the ground floor to the first floor. They managed to move many things safely. The local parish priest of St Mary’s Forane church, Rev Fr Pottackal Varghese, opened his presbytery for our priests and students to stay there on the evening of August 16th. For four nights, our men took shelter at the parish presbytery. Along with our men, many people whose houses were drowned in the flood also took refuge on the church premises. Men and women, together with children; the camp sheltered over three thousand people. A couple of our students shared with me how they felt sorry for the children struggling because of the flood, leaving their houses and their comforts and standing in long queues to get their stomachs filled with meagre porridge. It is very heart-breaking for anyone to see children struggling. As our men were away from the community, water levels gradually rose to the highest level, flooding the whole campus. At the entrance, the water level was even neck deep. The electricity department disconnected the power to the campus. Fr Baskar Raj, with the help of our neighbour, managed to get into the campus on a boat to capture the devastating and shocking scene at Sacred Heart Seminary. The video was in circulation through WhatsApp and other social media to our confreres in India and abroad. Everyone who saw the video was overwhelmed by shock and dismay at the extent of water that engulfed our beautiful campus. After a couple of days, the water level eventually subsided. Though the reduced water level on the campus and the decreased rainfall came as a long-awaited relief, once our men went to see the campus, the sights that greeted them left them in shock and horror. Only then did they realise that tougher times were still ahead. Fr Baskar Raj and Fr Francis Babu visited the seminary periodically to see if anything needed their immediate attention. 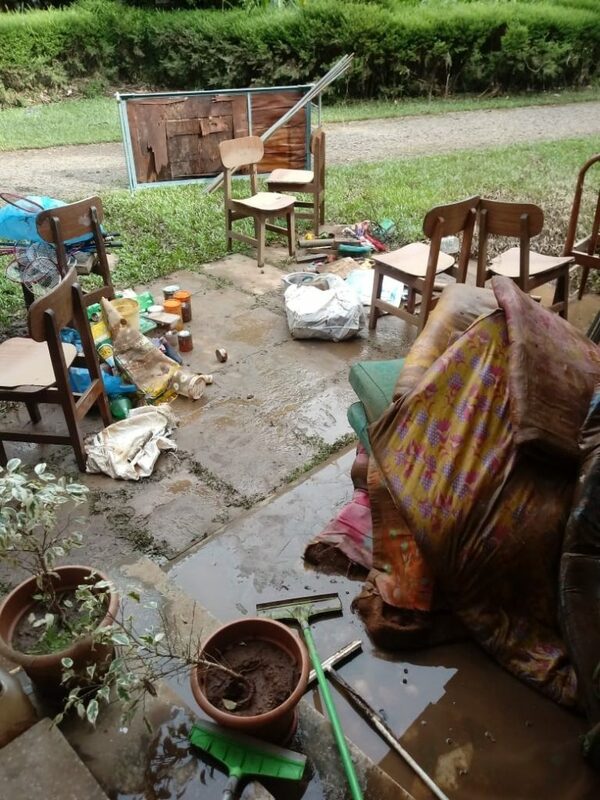 Fortunately, the water levels reduced, but the house still remained in a terrible state. Though it stopped raining and there was no threat from the water, the danger from the remnants of the flood seemed much more deadly than the flood itself. With so much slush and waste stagnated on the floor of every living area, cleaning the house seemed an endless task. In addition to being a laborious task, cleaning of the house was, in fact, hazardous to the community’s health. There was danger from snakes and poisonous insects hiding in the house; as it was unavoidable, our men had to kill a snake. But with dedication and with uncomplaining commitment, our confreres and the students pulled their spirits and energy together. As the electricity was still disconnected, the only source of water was the well. 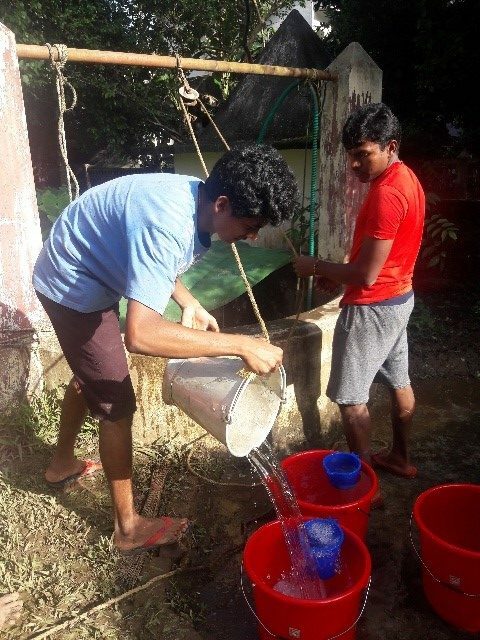 Students had to draw buckets and buckets of water from the well in the old-fashioned way with a rope. Though the task was extremely arduous, slowly and meticulously they cleaned one building after another on the campus, starting from the chapel. On August 18th and 19th, as they did not have the facilities to cook, they had their breakfast at the parish church, then came to our campus and cleaned the house, then went back for lunch and returned to resume the cleaning. Anyone can imagine how painstakingly difficult it has been for all our men. On August 20th, as the house was to some extent liveable, our confreres and students returned to the community, without drinking water and electricity. Until this time, no one outside Kerala could get to our community as the transport system was completely disconnected. On August 21st, as soon as the transport system resumed, Frs Tijo John, Irudhaya Raj, Richard, and I drove down to Kanjoor from Bangalore. At places like Palakkad and Trissure, roads were very severely damaged, but we managed to get to the Sacred Heart Seminary by 5.00pm after eight hours of driving, taking with us 140 litres of drinking water and utensils to clean the seminary premises. Our arrival was seen as a welcome relief for them. We could see great joy in our confreres that someone was visiting them in their time of difficulty. Fortunately, after we arrived, the electricity connection was restored, after many hours of meticulous cleaning of the electrical room which was submerged in water for days. The damage caused by the flood was colossal. The furniture that was destroyed is going to cost us a lot. We need to do a lot of repair works to the building, painting the inner and outer walls of the buildings, and replacing the water-damaged furniture. We spent two more days with the Sacred Heart community, helping them in cleaning the seminary and assisting them in bringing things back to their normal routine. We really admired the dedication and commitment of our men in fighting the odds posed by the flood. The spirit of courage and forbearance they exercised was indeed praiseworthy.